Our philosophy is simple: to work closely with our clients assisting them to be successful and to grow. We hold strong rural and family values, and strive to deliver a forward thinking, high quality professional service. Our team is vibrant and energetic and prides itself on searching to provide the best solution for you. 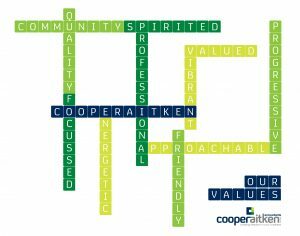 CooperAitken will help create freedom in your business by providing you with peace of mind, they will help save you money and save you time. We want the very best for our clients, for them to be successful and grow. Increase your business and personal options for the future including: buying and/or merging a business, selling a business, succession planning, retirement and estate planning and trusts.